Choose Happpy Wren House utilizes the great artwork of Wendy Wiinanen. 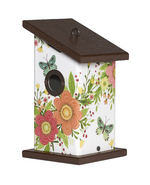 What a great way to attract birds to your garden and add vibrant color to your outdoor space! The wren house has as fledgling ladder, universal 1.125" entrance hole, ventilation and drainage holes and a removable rooftop for easy cleanout. Measures 5"w x 9"h and is made from sturdy PVC that has been wrapped in a fade-resistant vinyl. Wren houses have a rooftop loop for hanging. Great Gift idea for the Garden Lover or Birder on your list!